Under the recent popes, the central ecumenical concern has been the division of the Church that took place in 1054, when the Eastern and Western Churches split in bitter animosity. Healing this division without abandoning principle on either side is the top priority of the Vatican, compared with which the ecumenical importance of the Catholic-Protestant split is less significant. 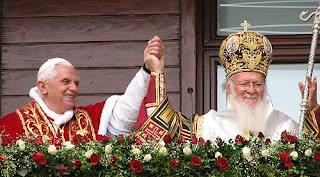 Benedict XVI's trip to Turkey was clearly an effort to further the ties between the Eastern and Western Church. The fact that the meeting between them took place in a country where Islamic intolerance has reduced the Christian presence from what it was at the beginning of the 20th century -- 50% of the population -- to what it is today -- less than 1% of the population -- served to underscore the importance of the ecumenical journey that was given new hope by the pope's trip. He concluded his remarks by saying: "May our encounter today serve as an impetus and joyful anticipation of the gift of full communion. And may the Spirit of God accompany us on our journey!" Patriarch Bartholomew I arrives, decked in brilliant finery and surrounded by black-clad deacons and Metropolitans. Pope Benedict XVI arrives, dressed in thick red robes, and accompanied by bright red-and-purple Cardinals. The Liturgy, which has already been underway for an hour, assumes a new pitch. The lights brighten. The gold upon the icons flare. We pray. We worship for another four hours, with varying levels of comprehension of the thousand-year-old Greek of the Liturgy. I scurry about from point to point, taking photographs and looking on in awe. Finally, it comes time for Communion. My father asks me if I will go, and I reply that I probably should not. He urges me to, and I give in. 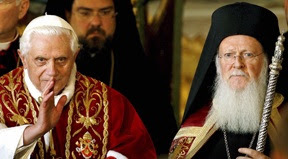 Now, we file forward, toward the Ecumenical Patriarch His All-Holiness Bartholomew I, holder of the last office of the Eastern Empire, who gives us the Body of Christ. Mere feet away, Benedict XVI sits on the Papal throne, looking down upon us supplicants. I am overcome and cannot glance toward him. Behind me, others have more courage: they break from the line, rush forward, and kiss Benedict’s hand. He is calm and gentle. He smiles and clasps their hands, saying a few words in German and English, before urging them to go receive the Eucharist. It is profoundly moving too see these devout Orthodox who have come to pay homage to the bishop of the New Roman, and who are so overwhelmed with the presence and love of the bishop of the Rome that they must give him the same. The small space encompasses a universe, and we are at its center. Bartholomew ascends to the iconostasis and welcomes Benedict in Greek. Benedict, aware of the cameras surrounding him, replies in English. We must, he says, recall Europe to its Christian heritage before it is too late – and we must do it together. Then they emerge into the cold sunlight of a cold day. They ascend to a balcony overlooking the courtyard where we gather in expectation. They speak briefly. And then, they clasp hands, Pope and Patriarch, smile and raise their arms together. Tears come to my eyes, and I am shocked to see several media personnel crying openly. For an instant, the Church is one. For a shadow of a second, the dreams of Christendom are again real. Seen through worldly eyes glazed over by the spirit of the age, the meeting between Benedict XVI and Bartholomew I was hardly even news. Those journalists in attendance, however sophisticated their technology, were for the most part members of generation of journalists who were virtually trained to overlook the historical significance of religious developments, and, again for the most part, they did just that. But not only the faithful are there: there is also the media of the world, armed with telephoto lenses and cameras, and looking shabby in the way that media typically do. It does not occur to them to dress appropriately – one may wish, after all, to look presentable before the putative Vicar of Christ on Earth – but then, it wouldn’t. They crowd onto platforms along the periphery of the chapel, and wait. Here we have two cultures peering across a great abyss at one another, not the Eastern and Western Churches, for between them there was a remarkable degree of sacramental accord. The abyss was between the media-saturated global culture, represented by the shabbily dressed journalists fidgeting with their equipment, and the universal Church, represented by the stately gravitas of the successors of Andrew and Peter. The former trivializing everything it touches, turning even great tragedies into the stuff of idle chatter, the latter dignifying the most mundane struggles of life and the perennial questions of the heart by incorporating them into a drama of incomparable grandeur and seriousness. How important was this meeting between the successors of Peter and Andrew? We won't know for sure for at least a century or two. Meanwhile, we have every reason to take heart from what happened at the church of St. George under the thuggish glare of an intolerant culture. The light shines in the darkness.